(Spanish for Jerome, applied by the Mexicans as a nickname; native name Goyathlay, `one who yawns'). "Geronimo is said to have had magical powers. He could see into the future, walk without creating footprints and even hold off the dawn to protect his own. This Apache Indian warrior and his band of 37 followers defied federal authority for more than 25 years. A medicine man and prophet of the Chiricahua Apache who, in the latter part of the 19th century, acquired notoriety through his opposition to the authorities and by systematic and sensational advertising; born about 1834 at the headwaters of Gila River, New Mexico, near old Ft Tulerosa. His father was Taklishim, `The Gray One,' who was not a chief, although his father (Geronimo's grandfather) assumed to be a chief without heredity or election. Geronimo's mother was known as Juana. When it was decided, in 1876, in consequence of depredations committed in Sonora, of which the Mexican government complained, to remove the Chiricahua from their reservation on the south frontier to San Carlos, Ariz., Geronimo and others of the younger chiefs fled into Mexico. He was arrested later when he returned with his band to Ojo Caliente, New Mexico, and tilled the ground in peace on San Carlos reservation until the Chiricahua became discontented because the Government would not help them irrigate their lands. In 1882 Geronimo led one of the hands that raided in Sonora and surrendered when surrounded by Gen. George H. Crook's force in the Sierra Madre. He had one of the best farms at San Carlos, when trouble arose in 1854 in consequence of the attempt of the authorities to stop the making of tiswin, the native intoxicant.During 1884-85 he gathered a band of hostiles, who terrorized the inhabitants of south Arizona and New Mexico, as well as of Sonora and Chihuahua, in Mexico. Gen. Crook proceeded against them with instructions to capture or destroy the chief and his followers. Cochise. A Chiricahua Apache chief, son and successor of Nachi. Although constantly at feud with the Mexicans, he gave no trouble to the Americans until after he went, in 1861, under a flag of truce, to the camp of a party of soldiers to deny that his tribe had abducted a white child. The commanding officer was angered by this and ordered the visiting chiefs seized and bound because they would not confess. One was killed and four were caught, but Cochise, cutting through the side of a tent, made his escape with three bullets in his body and immediately began hostilities to avenge his companions, who were hanged by the Federal troops. The troops were forced to retreat, and white settlements in Arizona were laid waste. Soon afterward the military posts were abandoned, the troops being recalled to take part in the Civil war. This convinced the Apache that they need only to fight to prevent Americans front settling in their country. Cochise and Mangos Coloradas defended Apache pass in southeast Arizona against the Californians, who marched under Gen. Carleton to reopen communication between the Pacific coast and the east. The howitzers of the California volunteers put the Apache to flight . 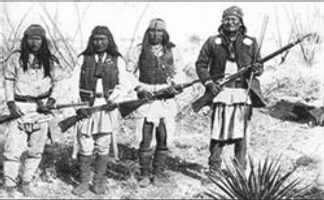 When United States troops returned to resume the occupancy of the country after the close of the Civil war, a war of extermination was carried on against the Apache. Cochise did not surrender till Sept., 1871. When orders came to transfer his people from Canada Alamosa to the new Tularosa reservation, in New Mexico, he escaped with a hand of 200 in the spring of 1872, and his example was followed by 600 others. After the Chiricahua reservation was established Arizona, in the summer of 1872, he carne in, and there died in peace June 8, 1874. He was succeeded as chief by his son Taza. The southeastern most county of Arizona bears Cochise's name. In 1918, certain remains of Geronimo were apparently stolen in a grave robbery. Three members of the Yale secret society of Skull and Bones served as Army volunteers at Fort Sill during World War I one of those three members was actually George W. Bush's grandfather. They reportedly stole Geronimo's skull, some bones, and other items, including Geronimo's prized silver bridle, from the Apache Indian Prisoner of War Cemetery. The stolen items were alleged to have been taken to the society's tomb-like headquarters on the Yale University campus, and are supposedly used in rituals practiced by the group, one of which is said to be kissing the skull of Geronimo as an initiation. The story was known for many years but widely considered unlikely or apocryphal, and while the society itself remained silent, former members have said that they believed the bones were fake or non-human. The skull of the worthy Geronimo the Terrible, exhumed from its tomb at Fort Sill by your club... is now safe inside the tomb together with his well worn femurs, bit and saddle horn. Prescott Bush, grandfather of our president and several others, according to a growing body of evidence, desecrated the grave of Geronimo, Apache Holy Man; removing his skull, and a prized silver bridle that was buried along with him. Using acid they stripped the skull of flesh and hair then took their trophies back to a secret clubhouse at Yale University according to data provided by Will Russell of Vanguard Consulting. The "Skull and Crossbones Society" was officially formed at Yale in the year 1832 but its roots go back a decade or so prior to that. This is the same period where graverobbing by Yale students at the Quinnipiac Burial Grounds at Beacon Hill in East Haven took place. Townshend admits that "in the year 1822 I examined three of these graves%u2026" long before the students did so. Our research indicates it was Townshend and his rich cronies at Yale who concocted this secret society to gain wealth, fame and notoriety by desecrating the graves of our ancestors. Several years ago documents and photos were leaked about this secret society which enraged the conscience of the American people and Indian First Nations across America and Canada. These documents detail Prescott Bush's "graverobbing exploits" with a photo showing a skull and bridle on a shelf next to a framed picture of Geronimo. The headquarters of this SKULL AND CROSSBONES SOCIETY is in a windowless building known as "THE TOMB" at 64 High Street in New Haven, Connecticut. Each year fifteen Seniors at Yale are "tapped" or exclusively initiated into the elite membership of this club of bone-worshipers and grave-robbers. Yale has refused to clean up its act and we believe this is because it values wealth, power and elitism much more than it values respecting the rights of our First Nations to be shown dignity and respect concerning our ancestor's remains. On Wednesday, May 10th, 2006 Associated Press reporter Stephen Singer filed an exclusive feature with headlines that screamed "LETTER BACKS YALE TALE THAT CLUB STOLE GERONIMO'S SKULL" (view a photocopy of the article below).<a name="RETURN1"></a> The story says that a Yale researcher from Hartford named Marc Wortman dug up a letter written by a member of this elite club written in 1918 confirming the truth. This letter, written by Winter Mead states, "The skull of the worthy Geronimo the Terrible, exhumed from its tomb at Fort Sill by your club %u2026 is now safe inside the (tomb) together with his well worn femurs, bit & saddle horn."